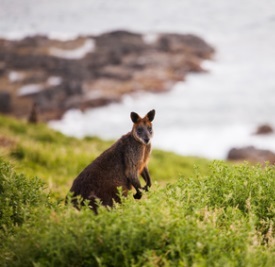 Kangaroo Island is famous for offering visitors the chance to get up close and personal with all kinds of wildlife. Of course, kangaroos are a big attraction, but koalas, fur seals, platypuses, sea lions, a wide variety of birds and more can all be seen during tours, though some species’ habitats may require the help of a guide to access. Natural formations like Remarkable Rocks and Kelly Hill Caves and tourist-friendly lighthouses also receive many visitors. Like most of Australia, Kangaroo Island offers lots of coastline for beach activities and water sports, and several dining options and souvenir shops are available.